About Beauty Travel Lifestyle Portfolio Subscribe! The exquisite acapella voice of Christina Aguilera rehearsing rang over NYC’s Le Poisson Rouge as fellow nail artist Naomi Yasuda and I were triple-confirming the nail looks for that evening’s 45-minute drag extravaganza. 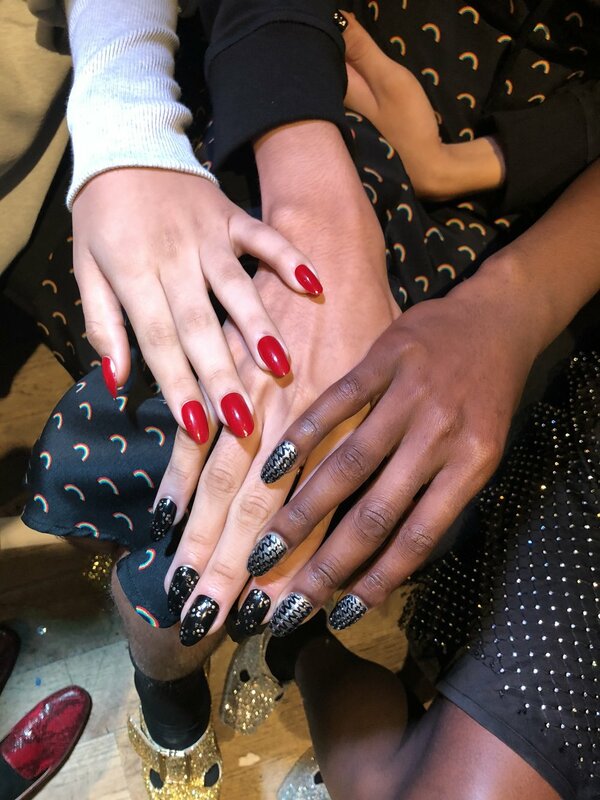 Looking over the lineup board of the 30-plus collaborators and performers, it was just hours before the Opening Ceremony show and we wanted to be sure of who was wearing which set of hand-painted press-on nails we created that weekend. To have a 45-minute show during fashion week is nearly unheard of (normally a show at Fashion week only around 8 minutes! ), but it just proves just how loved the designers, Humberto Leon and Carol Lim are - along with RuPaul’s Drag Race season 9 winner Sasha Velour, who produced and MC’d “The Gift of Showz” is. But it was a celebration of drag culture and the LGBTQ community, and what better way than to have an all-out drag performance, wearing clothes created from the designers Spring/Summer 2019 fabrics? In the days prior, Naomi and I met with Humberto and Sasha to discuss the nails we would be creating for all of the talent and performers. And they each would have different looks (normally all the models have the same look) per their clothes and role in the show. How exciting!! But it was a tall order - most of the performers would be wearing press-on nail tips that we would have to make prior to the show. Overall - about 900 nails total! Many thanks to my team - Arelis, Halle, Meagan, and Kayo, to essie, BPCM, Naomi Yasuda, and Carol and Humberto, thank you for letting me be a part of this brilliant show!